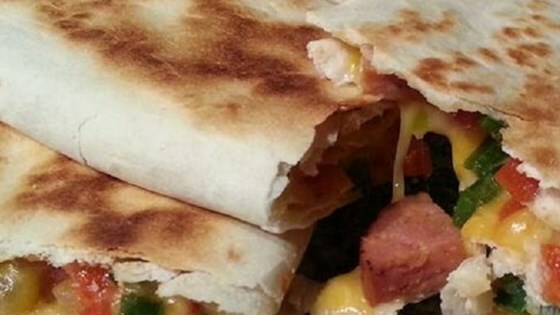 "These quesadillas are unique and filling - with a bit of a kick! If you have any leftover filling, scramble with some eggs for a Tex-Mex breakfast." Heat 1 tablespoon of canola oil in a large skillet over medium heat. Stir in the diced sausage, poblano pepper, red pepper, red onion, and corn. Cook until soft, about 15 minutes. Spoon 1/4 of the sausage mixture on one half of each tortilla; top each with 1/2 cup cheese. Fold over tortillas to make a half moon shapes. Repeat with remaining ingredients. Heat the remaining 1 tablespoon of canola oil in large skillet over medium heat. Cook quesadillas until the cheese is melted and the tortilla is brown and crispy, about 5 minutes per side. Cut each quesadilla into 4 wedges, and top with sour cream and salsa, if desired. Andouille and poblano are great together. Good recipe...I'd make it again. Great flavor! My BF makes sausage at the local butcher shop so I am always looking for recipes that call for sausage. Easy quick and yummy!